VivaColombia made its official debut as Colombia’s lone low-cost carrier on 25-May-2012, ushering in what it hopes to be new era in air travel in the booming Colombian market, which recorded in 1Q2012 a 12% hike in domestic passengers traffic to 3.8 million. While the carrier’s stated goal is to shy away from highly competitive Colombian trunk routes, markets in VivaColombia’s initial roll-out include some of Colombia’s busiest routes that are dominated by the country’s largest carrier Avianca and LAN Colombia, which is expanding capacity after taking time in 2011 to restructure the former unprofitable operations of Aires. The LAN-initiated restructuring included dropping Aires' LCC model, which was introduced in early 2009 when the carrier gave Colombia its first taste of low fares, stimulating demand as domestic passenger traffic grew in Colombia by 13% in 2009 and a staggering 30% in 2010. The growth slowed in 2011 to only 5% to 14.6 million passengers as Aires significantly cut capacity. But for 2012 the growth in Colombia's dynamic domestic market is expected to return to double digits, driven partially by VivaColombia's launch. VivaColombia’s owners have ambitious plans to create a pan-Latin American low-cost carrier network in conjunction with sister carrier VivaAerobus, which launched during Mexico's LCC boom in 2006. But first they need to prove that Colombia remains fertile ground for the low-cost model after the failed attempt by Aires to create a low fare brand. That attempt nearly drove Aires into ruin before it was bailed out and acquired by Chile-based airline group LAN in 2010. VivaAerobus during the last two years has been able to benefit from the demise of one of Mexico’s largest competitors, Mexicana, which ceased operations in 2010 and created an opportunity for the country’s remaining airlines to absorb the defunct carrier’s capacity and accelerate growth. During 1Q2012, VivaAerobus was the fourth largest carrier in the Mexican domestic passenger market, with a 10% share. The Colombian domestic market features a unique market dynamic with three major Latin American airlines groups – Avianca-TACA, LAN and Copa – all serving the market with full service models. 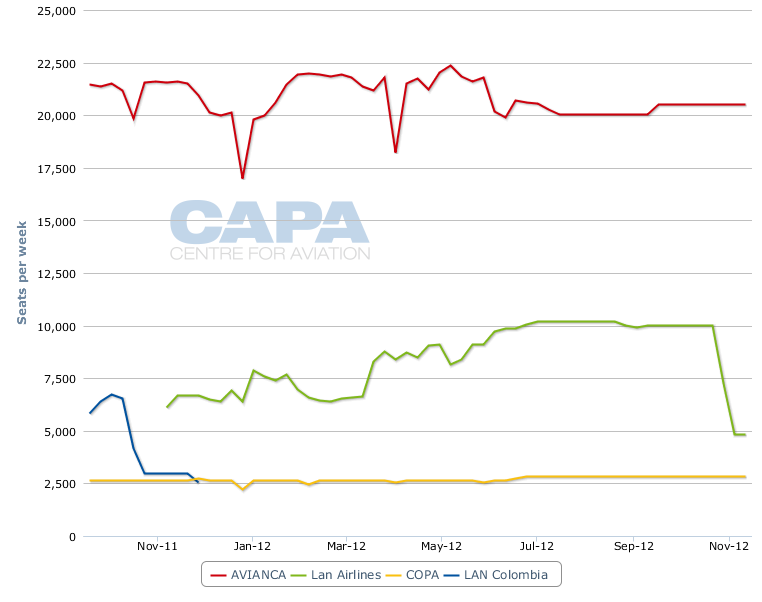 Avianca, LAN Colombia and Copa Colombia carried about 86% of the country’s domestic air passengers in 1Q2012. Avianca remains Colombia's market leader, carrying 59% of the country's domestic passengers and 39% of international passengers in 1Q2012. Copa Colombia is primarily an international carrier, carrying 16% of Colombia's international passengers in 1Q2012 (which excludes passengers carried to/from Colombia by its sister Panamanian carrier) but only 8% of domestic passengers. 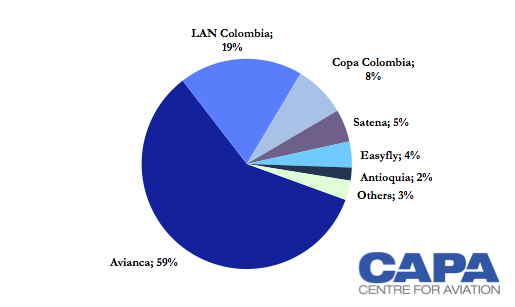 LAN Colombia for now is almost entirely a domestic carrier, accounting for 19% of the domestic market in 1Q2012, although it plans to embark on international expansion as part of the second phase under LAN ownership. VivaColombia also plans to test out the international market but is focused on first building up its domestic network. Colombia also has three regional carriers – Satena, Easyfly and Aerolineas de Antioquia. Government-owned Satena, which codeshares with market leader Avianca and operates a mix of regional jets and turboprops, captured 5% of the domestic market in 1Q2012. Privately-owned turboprop operators Easyfly and Antioquia captured 4% and 2% of the market, respectively. All three of these regional carriers will be impacted by VivaColombia's launch as the new LCC plans to stimulate demand on markets bypassing the capital Bogota, which are completely un-served or are now only served by Satena, Easyfly, Antioquia or Avianca's Fokker 50 turboprop operation. VivaColombia believes it can corner and stimulate traffic in the low-end, price-sensitive Colombian traveller and visiting friends and relatives (VFR) markets being opened up as Colombia’s economy continues to grow. The country’s GDP growth is estimated to increase 4.5% this year after peaking at 4.9% in 2011. VivaColombia CEO Fred Jacobsen told CAPA in Nov-2011 that VivaColombia would not repeat the same mistakes Aires made in attempting to create a low-fare brand in the Colombian market. Most notably, unlike locally owned Aires, VivaColombia has been well capitalised and is supported by an impressive list of international owners that include Irelandia, which is run by the Ryan family, Mexican bus company IAMSA and Colombia’s Grupo Bolivar. Mr Jacobsen and some of VivaColombia's other executives, including former Avianca CEO Juan Emilio Posada, also own stakes in the new carrier. Irelandia and IAMSA also own stakes in VivaAerobus. Unlike Aires, which operated a mix of Bombardier Dash 8 turboprops and Boeing 737-700s, VivaColombia will stick to a single operating fleet of A320 aircraft. The airline inaugurated service with three A320s and is expected to have a fleet of five A320s in service by Sep-2012. Mr Jacobsen also stressed last year that VivaColombia was “betting on a market that nobody knows about”, referring to the fact that many Colombians still rely on long bus trips to travel domestically, which is similar to the Brazilian market more than a decade ago when LCC Gol seized on the opportunity to stimulate demand by offering fares similarly-priced to bus tickets. Ancillary revenue from various product unbundling initiatives will also be key to VivaColombia’s strategy. Its carry-on allowance is 10kg and all checked baggage is subject to a charge. Local Colombian press reports indicate that VivaColombia is offering priority boarding for a fee, which is a practice being adopted globally by both network and low-cost carriers. VivaColombia has identified 11 primary and 11 secondary routes where it has secured authority to offer service. The carrier is largely sticking to its stated strategy of avoiding Bogota and instead focussing on thinner routes with a leisure bent. In its first week of operations, from 25-May-2012 to 01-Jun-2012 it will operate 40 flights from its base at Jose Marie Cordova Airport in Medellin to Bogota and Cartagena. The carrier will launch several more routes in Jun-2012 including Medellin to Cali, Barranquilla, Bucaramanga and Pereira; Bogota to Cartagena; Cali to Cartagena; and Cartagena to Pereira, according to the carrier's website. Flights from Medellin to Apartado and Monteria are shown as launching in Jul-2012. Many of these routes are regional routes not currently served by any jet operators. VivaColombia in its initial phase will serve four of Medellin's top destinations in terms of seats offered: Bogota, Cali, Cartagena and Baranquilla. Bogota-Medellin is the biggest domestic route in all of Colombia, according to Colombian CAA data. In 2011, almost 2.4 million passengers were transported between the two cities. Avianca, LAN Colombia and Copa Colombia all now offer flights on the route. Note: Excludes VivaColombia capacity. Satena capacity not listed here as it serves Bogota from Medellin's Herrera Airport. Of the other routes VivaColombia plans to serve in its first phase only Bogota-Cartagena is a major trunk route. Bogota-Cartagena is the third largest route in Colombia, with 1.6 million passengers flying between the two cities in 2011, according to Colombian CAA data. On Medellin-Cartagena, Avianca is now the only operator in addition to the just-launched VivaColombia. Medellin to Barranquilla and Cali are also routes currently only served by Avianca. The response by Avianca will be interesting as the market leader will likely lower its fares in an attempt to stave-off passenger spill to VivaColombia. On a roundtrip flight between Medellin and Cali for travel in Jun-2012 Avianca’s current lowest fare is COP281,120 (USD154.29) while VivaColombia’s lowest fare is COP166,868 (USD91.58). Avianca’s lowest fare on flights in the Medellin-Cartagena market is COP497,406 (USD273) compared with COP192,068 (USD105.42) for VivaColombia. On flights between Medellin and Barranquilla Avianca’s cheapest fare is COP674,140 (USD370) while VivaColombia is charging COP213,568 (USD117.22). VivaColombia’s base fares excluding taxes and fees range from COP29,900 (USD16.41) to COP79,900 (USD43.85). Data from Colombia’s civil aviation authority show VivaColombia has ample opportunity for market stimulation on routes where Avianca is its sole competitor. Traffic jumped 82% year-over-year in Jan-2012 on the Cartagena-Medellin route on 80% capacity growth, driving up load factors 1.2 ppts to 80%. Loads fell 2.5 ppts to 75% on in the Cali-Medellin market as the 20% capacity growth outpaced the 16% capacity increase in Jan-2012. Traffic between Barranquilla and Medellin jumped 103% year-over-year on 99% traffic growth, driving load factors up 1.8 ppts to 86%. The monopoly Avianca has enjoyed on those routes has allowed the carrier to gain pricing traction, evidenced by the higher fares it is charging in all three markets. The fact that all these markets recorded large year-over-year capacity increases in January indicate that Avianca was already preparing for VivaColombia's expected entry. VivaColombia will also compete against LAN Colombia on flights from Medellin to Pereira, Monteira and Bucaramanga, which has Colombia’s fifth largest economy. Jetstream 41 turboprop operator EasyFly also operates on the Medellin to Bucaramanga, Montreria and Apartado routes while Jetstream 31 turboprop operator Antioquia operates on the Medellin to Pereira, Montreira, Bucaramanga and Apartado routes, according to the EasyFly and Antioquia websites. Satena also serves Medellin-Apartado, according to schedules from Innovata. LAN Colombia, Antioquia, EasyFly and Satena primarily serve these routes from Medellin Enrique Olaya Herrera Airport, which is roughly 19km from Jose Maria Cordova Airport and is located closer to the city centre. Herrera Airport can only accommodate turboprops. Antioquia is based at Herrera Airport, where it operates about 15 routes. As a result, any regional route launched by VivaColombia from its Medellin Jose Maria Cordova base will almost certainly face indirect face competition from Herrera. But VivaColombia will be pursuing a different segment of the market: targeting the VFR or leisure sector with large aircraft, low fares and low frequency while the carriers at Herrera target the business traveller with higher frequency and much smaller aircraft. In addition to regional routes such as Apartado, Satena also uses Herrera for its services from Barranquilla to Bogota and Cali, which is geared to business passengers willing to pay a premium for the convenience of Herrera's more central location. Bogota-Barranquilla is served by all other carriers from Jose Maria Cordova with narrowbody jets. LAN Colombia now operates Dash 8 turboprops on regional routes inherited from the Aires acquisition while it uses A320s and 737-700s for trunk routes. Turboprops and small regional routes are not typically part of the LAN strategy but the group has not yet formally announced the discontinuation of turboprop operations in Colombia. For now, LAN fleet projections only show three of the 14 turboprops at LAN Colombia (10 Dash 8-200s and 4 -400s) are scheduled for return to lessors in 2014. While the smaller markets VivaColombia is launching from its Medellin base are already served, stimulation opportunities exist for VivaColombia as it comes in with larger aicraft than the incumbents. CAA data show that traffic in the Medellin-Pereira fell 20% year-over-year in January on a 22% decline in capacity. In addition to offering a lower fare with a bigger aircraft, VivaColombia could have an advantage over LAN Colombia as LAN continues to work to regain passenger trust after Aires suffered from chronic unreliable operations before LAN took over Aires. On its point-to-point markets outside of Medellin, VivaColombia will face competition from Avianca on flights from Cali to Cartagena. Schedules show no service is currently offered from Cartagena to Pereira. VivaColombia was awarded 10 "pioneer" route authorities by Colombia's CAA. The routes have the pioneer status because they currently have no service. The Colombian Government is giving the carrier one year beginning this month to operate those routes with guarantees that it will not face competition from another carrier. Mr Jacobsen has said that VivaColombia would pick and choose the pioneer routes the carrier would operate. 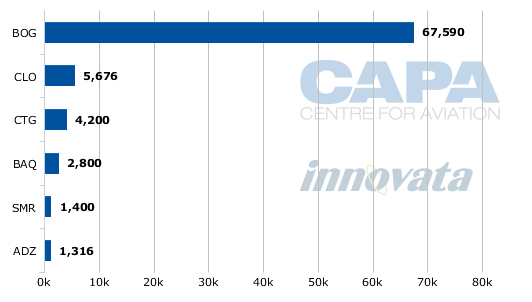 With five aircraft at year-end, the carrier will likely only introduce a couple of those markets during 2012 as it also spools up capacity on some more traditional routes. The pioneer routes would be launched with low frequency service, following the model used by VivaAerobus and Ryanair when opening up markets that previously were un-served. VivaColombia has said it has approval to serve several secondary destinations including Riohacha, Valledupar, Cucuta, Barrancabermeja, Yopal, Villviencio, Neiva, Popyan, Armenia, Ibague, and Leticia. These markets are now primarily served from Bogota but VivaColombia is more likely to serve them from other Colombian cities. Current schedules from Innovata show both Avianca-TACA and LAN Colombia operate flights from Bogota to Ibague, Armenia, Neiva, Valledupar and Santa Marta. LAN Colombia offers flights from Bogota to Riohacha, Yopal, Villavienco and Leticia, and from Cucuta to Barrancabermeja. 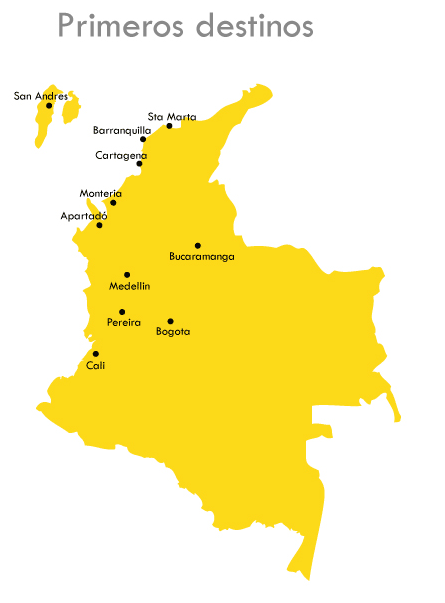 Copa Colombia also operates flights from Bogota to Santa Marta, Cucuta, and Leticia. 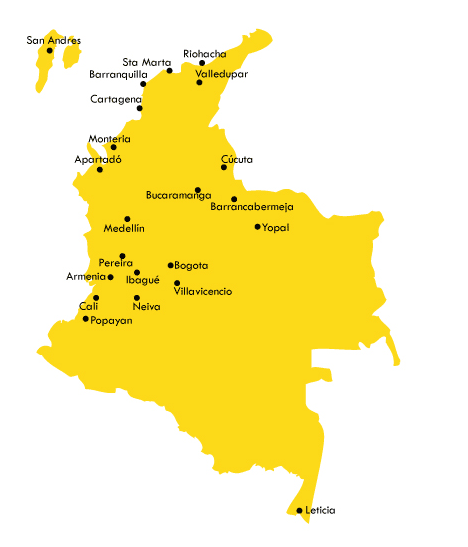 In addition, regional operators Satena, EasyFly and Antioquia operate to several of these destinations from Bogota or other major Colombian cities such as Medellin. VivaColombia launches with much promise, pledging to bring a true low-cost and low-fare business model into the growing Colombian market. The airline debuts with strong financial backing and an experienced and competent management team led by Mr Jacobsen, who previously was the CEO of Colombian cargo carrier Tampa. But VivaColombia's full service carrier competitors Avianca, LAN Colombia and Copa Colombia are also gearing up to protect their markets, and will fiercely defend their strongholds in the country's fast-growing domestic market.